Last week I was debating, pondering and ruminating over the idea of changing the name of my blog. I have said this several times before, but my blog now isn't really all that much about food and in the case of the "fur" in my title, my dog William only occasionally makes an appearance. Regardless, I am always up to tantalize the taste buds of my followers, offer a little bit of culture or share some pics of William when he is willing to sit still. So for now, I'll be keeping my name. When I do post about food, I like to keep it simple. If something is complicated, there is too much to explain regarding the recipe and I am too busy putting my dish together to document it. Most people want quick and easy recipes anyway. 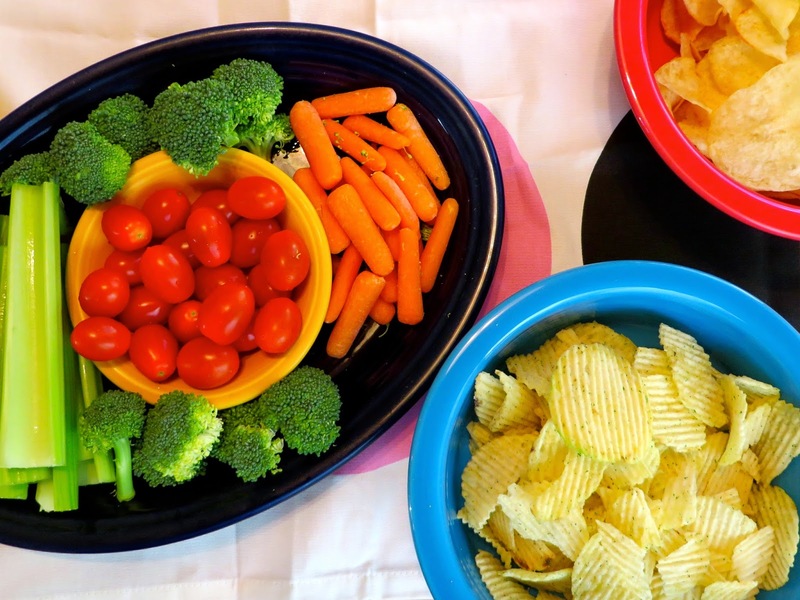 The Super Bowl last weekend provided a perfect opportunity to make some simple yet delicious dishes, both of which involved dipping, which came in handy when it was time to name this post! 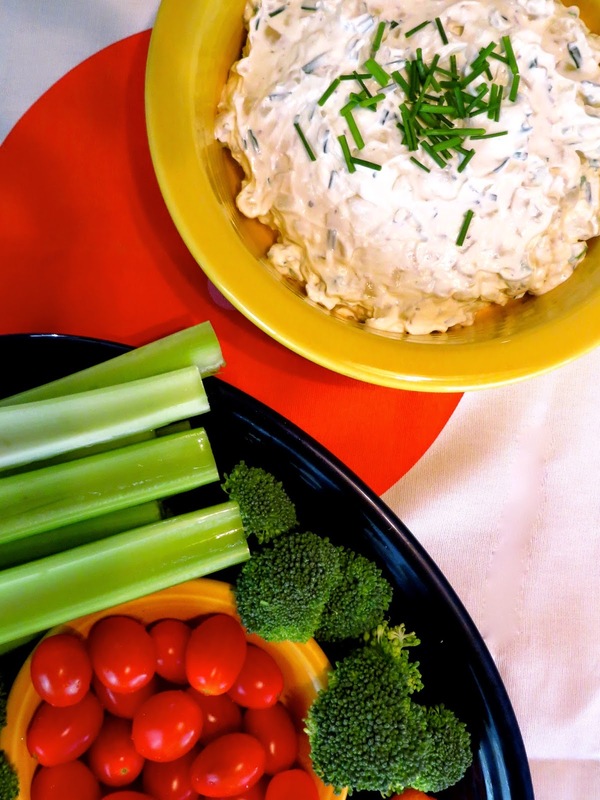 Above you will see a simple sweet onion dip from Martha Stewart. Martha Stewart's website is my go to place for recipes that I know will work. I am not really one for dip, but this one is pretty good and was easy to whip up. The only problem? Your dog is liable to dip his/her nose in it. Well, maybe that's just my dog. I wish I had a camera handy to snap a picture of his nose covered in Martha's dip, the recipe for which can be found here. Below you will see some of the food that I think goes well with any dip, but especially sweet onion dip. There are vegetables for people who are health conscious. (Although there is a bunch of fat in the dip!) I prefer Sour Cream and Onion Ruffles for those of us who don't have any pretenses when it comes to what we are eating! The main course for my game day feast was roast beef or French dip sandwiches. Here is a secret about me: I actually am such as fan of the French dip sandwich that I have a list of every place where I've eaten one and a rating system to judge them. Apparently L.A. is the home of the French dip with two establishments (Philippe's and Cole's) warring over who came up with the recipe first. I really don't care as long as the beef is tender and there is plenty of Au Jus to go around! Rachel Ray provides a great recipe for the home cook to make the classic French dip sandwich in his/her own kitchen. The recipe has a simple beef consomme and shallot dipping sauce that's sure to make even the most discriminating French dip connoisseur take note. Rachel Ray's yummy and easy recipe can be found here complete with a video for visual learners. I suggest upgrading to Boar's Head roast beef, as I tasted the roast beef at several delis before making my final selection. I put the left over Au Jus sauce in ramekins for my guests. The one thing that really upsets me about Philippe's in Los Angeles is that they don't provide their customers with extra Au Jus for dipping. Apparently, just asking for some will get you dirty looks from the staff. Well, in Katie's kitchen there is plenty of Au Jus to go around, which is why I would give my French Dip, I mean Rachael's, a 10 out of 10.